The Vikings, of all teams, should know a knee injury to a starting QB doesn’t stop a team from coalescing around its backup. 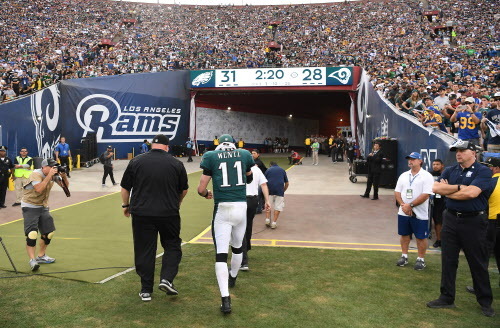 Philadelphia Eagles quarterback Carson Wentz walks off the field after injuring his leg against the Los Angeles Rams on Sunday, Dec. 10, 2017 at the Coliseum in Los Angeles, Calif. There was a slight air of despondence around Vikings fans after the team fell to the Carolina Panthers on Sunday afternoon, dropping to 10-3 and giving up a potentially important tiebreaker in the race for home-field advantage in the NFC, It continued into the early stretch of the Philadelphia Eagles’ game with the Los Angeles Rams, as Carson Wentz directed the conference’s other 10-win team to an early lead in California. But then Wentz got hit in the knee as he dove for the end zone in the third quarter, and ominous reports began to surface that the quarterback had sustained a serious injury. It appeared not only that the Eagles might lose, but that the Vikings might be chasing a team about to run out of gas. Philadelphia, of course, rallied for a late score behind Nick Foles to improve to 11-2, even as initial reports suggested Wentz might have torn his anterior cruciate ligament. That diagnosis could be confirmed on Monday, but Vikings fans would be wise not to assume a Wentz-less Eagles team is about to hand back its one-game lead in the conference. As much as the North Dakota State product has done to power Philadelphia’s rise in his second season, the Eagles have more than just Wentz. Their defense, ranked sixth in the league before Sunday, held the Rams’ top-ranked offense to a modest 307 yards, with one of Los Angeles’ five touchdowns coming on a blocked punt return. And though part of it had to do with Wentz’s ability to execute the zone read handoffs the Eagles have employed this year, the Eagles also have the league’s second-ranked run game, which posted 139 yards on Sunday. Foles has been a middling NFL quarterback, apart from his outstanding first year as a starter. But the Vikings, of all teams, should know a knee injury to a starting QB doesn’t stop a team from coalescing around its backup. Case Keenum — who supplanted Foles as the Rams’ starter during their last season in St. Louis — has taught them that. On a more practical — and perhaps a more important — level, the Eagles’ win on Sunday means they don’t exactly have to perform a Herculean feat to secure the top seed in the NFC. They face the 2-11 Giants next Sunday, before coming home to play the 6-7 Raiders on Christmas night. Their Week 17 game against the Dallas Cowboys would be Ezekiel Elliott’s second week back from suspension, and they could face an opponent making a desperate push for a wild-card spot. But if Philadelphia wins two of its final three games, the Vikings can’t claim the No. 1 seed in the NFC, since they’d lose the common-opponents tiebreaker with the Eagles. Now, it’s possible the Eagles could claim the No. 1 seed, only to lose their first playoff game with Wentz, and the Vikings could play the NFC Championship Game at home if they claim the No. 2 seed and win in the divisional round. But as the Vikings get back to work on Monday, they likely won’t be thinking about their home-field prospects, or hoping the loss of Wentz will automatically bring Philadelphia down in time to flip the NFC’s top two spots. It’d be wise for fans to follow their lead and maintain a narrower focus for the time being.